The effects on the water of an oil spill which occurred in mid 2007, near the community of Goi, Ogoniland, Nigeria, photo taken 28 January 2008. Apart from the available data, our mind eye observes that Nigeria’s income has been on the increase since independence. As the income increases so does expenditure. But as expenditure is increasing, so has budget deficit been on the increase as well. An unconstructive trend it seems but such appalling episode seems not limited to the public finance sector as a recent/widely circulated report on the state of the Global Air Report by Health Effects Institute (HEI) indicates that the burden of pollution on our nation has transcended to a ‘word made flesh’ and now dwells among us. Coming just a few days after the Department of Petroleum Resources (DPR) declaration that Nigeria has about 139 gas flare locations spread across the Niger Delta, The HEI described Nigeria as a country with the highest burden of fatalities from air pollution in Africa and 4th globally-with pollution now responsible for the death of 150 per 100,000 Nigerians; a position that barefacedly revealed that the nation’s environment is sick and the ecosystem troubled. Though an unhappy truth/ painful revelation, but, the greatest of this liability is that the nation found itself in this condition and yet failed to develop a new attitude that the situation demands, thereby railroading us slowly but inevitably to what future historians shall describe as a nation devastated by pollution-a fault both the corporate organizations and the government must share in its guilt. The fear expressed by Nigerians, looking at commentaries is that the solution appears not to be in sight and the situation constituting a challenge to the accomplishment of the 2030 sustainable agenda. While this probable fear pervades the nation’s wavelength, it is important to state categorically that the major factor fuelling this environmental crisis is that, nowhere in the world have environmental issues arguably caused so much federal –regional discord like in Nigeria. Characteristically, a region in Nigeria such as the Niger Delta house’s the crude oil deposits but lacks the constitutional power to sign, monitor or regulate the explorations as the land use act and other mineral laws in Nigeria exclusively vested such powers on the government at the center which, unfortunately, lacks the interest, plan and the will to develop the regions while forgetting that the chapter two of the 1999 Constitution vested on them the responsibility to ensuring equitable and efficient management of this resources/environment. The situation becomes more worrying when one remembers that in case after case, successive administrations have at different times and places expressed more interest in promoting petroleum production and the mining industry in general, politicized the environmental protection process with the environment remaining vaguely prominent on the agenda/given a symbolic attention without any substantial action. As we know, It was in a bid to compel the government’s response to glaring environmental injustice mated to the people of Ogoni land and other Niger Delta communities that propelled the Social and Economic Rights Action Center (SERAC) in close collaboration with the New York-based Centre for Economic and Social Rights(CESR) to file a communication (Social and Economic Rights Action Center (SERAC) Vs Nigeria) with suit Number 155/96 before the African Commission on Human and Peoples’ Rights against the Federal Military Government of Nigeria asserting that the wild spread contamination of soil, water and air, the destruction of homes, and the climate of terror visited upon the Ogoni communities constituted a violation of their rights to health, a healthy environment, housing, and food. 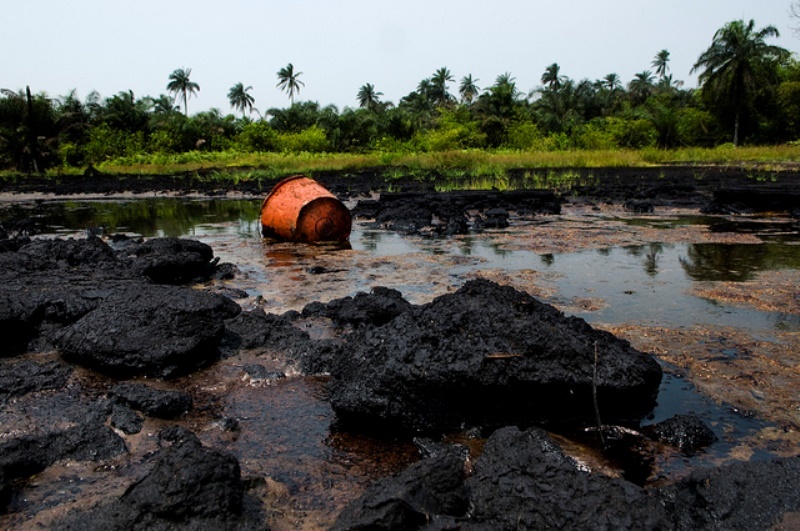 As a response to the communication, the Commission in October 2001, gave a well-considered rule finding the Federal Republic of Nigeria in violations of 2, 4, 14, 16,18(1),21 and 24 of the African Chapter on Human and Peoples’ (ACHPR), and therefore recommended a total cleanup of the polluted Ogoni and other adjourning communities in addition to taking preventive remedial and compensatory measures to improve economic and social outcomes for the Ogoni community. But guess what? Close to two decades after that judgment, the Ogoni and other communities are still waiting for the FG to implement the directive from the same commission that they are a signatory to; a development that is considered bad for morals. While this is ongoing, the Oil Majors operating in the region on their part capitalizes on these regulatory loopholes in their day-to-day interface with host communities and other state parties. They pursue policies chosen in advance of reason- policies designed to push the host communities further and farther away from getting involved in the management of their resources. Regrettably, to the vast majority of these operators, Corporate Social Responsibility (CSR) is considered ‘a dangerous fiction created as an excuse to impose an unfair burden upon the wealthy and powerful’. Supporting this position are different reports that have in the past indicted some of these operators with that of the United Nations Environment Programme (UNEP) and The Platform; a London based Non-Organization (NGO) monitoring the oil and gas industry the world over as vivid examples. As the masses watch the interplay, the world generally and Nigeria, in particular, is again greeted with a silent but alarming threat of plastic pollution. Indeed, it is a pedestrian knowledge that plastic pollution has become endemic as recent reports revealed that about 500 billion plastic bags are produced every year, with more plastic produced in the last decade exceeding that of the last century. Also frightening is the revelation that about 1 million plastic bottles are purchased every minute in addition to the world’s usage of 500billion plastic bags each year, with at least 8million tonnes of plastics ending up in the ocean- an equivalent of a full garbage truck every minute. Let’s make no mistake about it, an attempt to describe this frightening development as unfounded can only come at a heavy health and socioeconomic price as environmental experts have consistently warned that plastic pollution doesn’t just hurt marine species but to people as plastic debris floats in the seawater, it absorbs dangerous pollutants like PCBs, DDT, and PAH. These chemicals, according to health practitioners are highly toxic and have a wide range of chronic effects, including endocrine disruption and cancer-causing mutations. Expectedly, the recent Livability report which ranked Lagos as the third worst city to live in narrates this story better. According to the latest ranking, Lagos only outperformed Dhaka in Bangladesh and Damascus in war-torn Syria. Out of an overall score of 100, Lagos has rated 38.5 points, and the ranking was chiefly based on – Social Stability, Healthcare, Education, Culture and Environment and Infrastructure. As an incentive, Nigerians with critical interest have argued that ‘since the planet is our life support system, we are essentially the crew of a largish space ship, interference with its functioning at this level and on this scale is highly significant. If you or I were a crew on a smaller spaceship, it will be unthinkable to interfere with the systems that provide us with air, water, fodder and climate control. In line with this table of ideology, it has become eminently desirable that Nigeria takes ‘a cue from countries like China, Germany, and Rwanda who are among the world’s leading recyclers of waste and cutting down the use of plastic. They must move from the open landfills in every state of the country that has become eyesores to generating wealth from the recycling of these wastes’. Arresting these monster will also requires the Federal Government to among other things embrace, and work towards total remediation through ecological rehabilitation and environmental resuscitation of the Niger Delta region, adopt a coherent and friendly oil and gas policy that comprehensively enumerates oil companies responsibilities to the environment and host communities, focus on environmental protection and pollution control.